Wrap your little lucky charm up in a cozy bundle this St. Patrick’s Day in these 100% organic cotton eco-friendly spring pajamas from Polarn O. Pyret‘s ECO Collection. 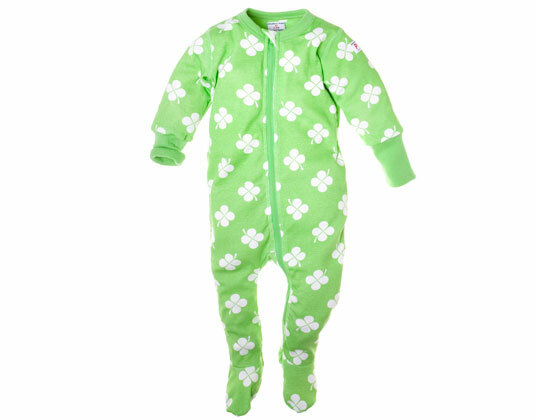 This sweet sleeper features stylized clovers on a fern green background, and on the practical side of things, a neck to ankle zipper which allows for easy diaper changes. The sleeve and ankle cuffs can be adjusted up or down allowing the sleepwear to transition with the growth of your child. Sizes newborn to 12 months — also available in Swedish blue with a hot air balloon pattern. Wrap your little lucky charm up in a cozy bundle this St. Patrick's Day in these 100% organic cotton eco-friendly spring pajamas from Polarn O. Pyret's ECO Collection. This sweet sleeper features stylized clovers on a fern green background, and on the practical side of things, a neck to ankle zipper which allows for easy diaper changes. The sleeve and ankle cuffs can be adjusted up or down allowing the sleepwear to transition with the growth of your child. Sizes newborn to 12 months -- also available in Swedish blue with a hot air balloon pattern.